Usain Bolt regained his 100 m world title and won a fourth individual World Championships gold with a season’s best of 9.77 seconds in Moscow. Usain Bolt’s compatriot Nesta Carter (9.95) claimed bronze, while Britain’s James Dasaolu was eighth (10.21). It was another convincing victory for Usain Bolt, who demonstrated his superiority by equalling the eighth-fastest time of his career in unfavourable conditions. 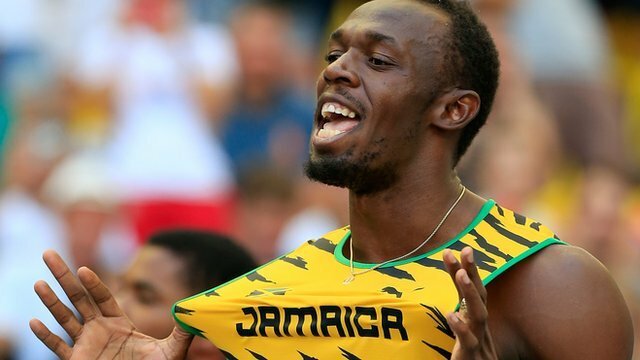 Such is Usain Bolt’s dominance of the event, he does not have to be at his quickest to win major championships. Justin Gatlin, who beat Usain Bolt in Rome in June, said: “I’m getting closer, I’m very happy with my race. The last 30m I got long. In Rome I was able to… do my race, which I didn’t do tonight. James Dasaolu, who ran 9.97 in the semi-finals earlier on Sunday, said: “I got to 50 m or 60 m but then they just started to run away from me. The sight of Usain Bolt surging past his rivals is now a familiar one, as is his fooling around at the start line – as the rain bounced off the Moscow track, he mimed holding an umbrella. When the gun went, his reaction time of 0.163 sec was equal to that of main rival Justin Gatlin, and the pair were shoulder-to-shoulder before Usain Bolt eased away. Perhaps the only disappointment of the evening was that the Luzhniki Stadium was not full for the championships’ blue riband event. Those who were there, however, saved their loudest cheers for the man charged with lifting the sport after a spate of failed drug tests, the most recent concerning Trinidad and Tobago sprinter Kelly-Ann Baptiste. But neither the rain nor doping scandals could dampen the celebrations as Usain Bolt, with flashbulbs lighting up the stadium, embarked on a jubilant lap of honor.